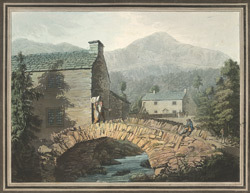 View by William Green of the packhorse bridge and an inn at Buttermere in Cumbria, Northern England. The countryside around the town of Buttermere is filled with lakes and mountains making it extremely picturesque. The bridge in this print is a packhorse bridge. It is simply designed with a single arch and is very narrow. These bridges were designed for horses carrying produce to market and would originally have been built from wood. They were rebuilt from stone in the 18th century. The artist William Green (1760-1823), was a well known landscape painter. He was born in Manchester and showed a talent for drawing from an early age. He became a surveyor but met topographer Thomas West who encouraged him to become a professional artist. In about 1800 he moved to the Lake District where he worked on his pictures trying to create accurate representations of the spectacular landscape around him.